BANGI, 7 Mar 2014 – The National University of Malaysia (UKM) have been able to produce graduates who are capable of dominating the job market related to the field of multimedia. Launching the 2014 Multimedia Creative Competition at the Faculty of Technology and Information Sciences ( FTSM ) today, Deputy Vice -Chancellor Prof Datuk Dr Noor Azlan Ghazali said he was very proud of UKM success in producing graduates in the creative multimedia industry in line with the rapid developments of the industry in the country. He hoped the programme would continue in the future because it could provide the experience and knowledge to the participants who may not be exposed to that in their lecture classes. The programme aims at fostering talents in the field of multimedia design, interface designers, instructional designers, art/creative directors, 2D or 3D animators, video editors or producers and others. 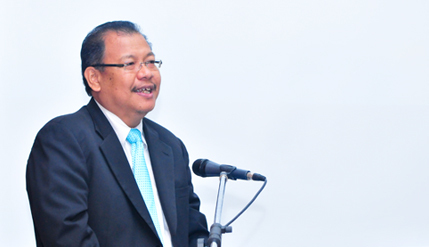 The competition was launched by Deputy Finance Minister Datuk Haji Ahmad Maslan. It was organised by the students of the faculty with full faculty backing. Present were the Chief Executive of Yayasan Perdana Malaysia, Hajah Noor Haji Masri Baini and FTSM Dean Prof Dr Abdullah Mohd Zain. Studentsts from many public and private universities including UKM and others like Universiti Kuala Lumpur (UniKL) and Akademi Seni Budaya dan Warisan Kebangsaan (ASWARA) took part. The contest was divided into two categories: Competition posters and 2D animation. Participants of the Poster Competition are individual who pay a fee of RM50 to enter and open to all students including from private higher education institutions. The 2D animation competition was a team event of two or three with each entry charged a RM100 fee. It is also open to all students of local universities, public and private . The first prize is RM700 with the Runners-up getting RM500 and RM300 each.